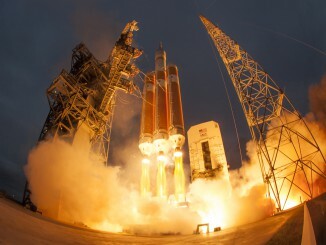 Take another look back at the Orion spaceship’s launch atop a Delta 4-Heavy rocket on Dec. 5 with this gallery of NASA and United Launch Alliance photos. Watch highlights from Orion’s Dec. 5 launch aboard a Delta 4-Heavy rocket as compiled for broadcast on NASA TV. 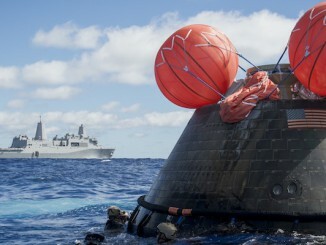 Fresh home from a high-flying test flight Friday that took it 3,600 miles above Earth, NASA’s Orion spacecraft was pulled off a U.S. Navy recovery ship Monday night for initial inspections before a cross-country trip to its home base in Florida. 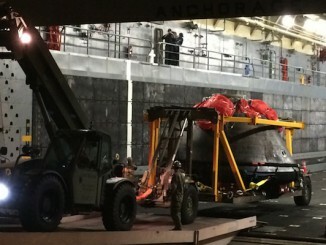 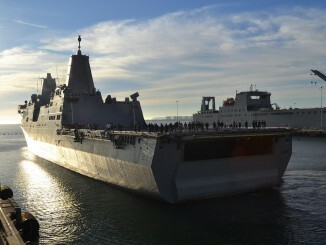 A U.S. Navy transport ship carrying NASA’s first space-worthy Orion capsule arrived Monday in San Diego, where ground crews will offload the spacecraft for shipment back to its home port at the Kennedy Space Center in Florida. 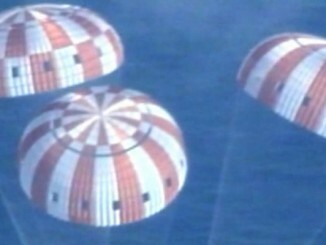 A recovery team stationed in the Pacific Ocean west of Baja California secured NASA’s Orion spacecraft and winched it into the flooded well deck of a U.S. Navy transport ship after the capsule splashed down into the sea to wrap up a successful four-and-a-half hour test flight. 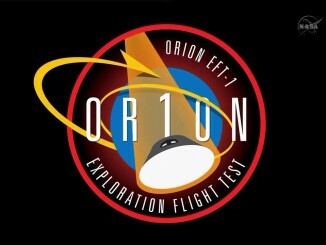 The United Launch Alliance Delta 4-Heavy rocket lifts off with NASA’s Orion ship on its inaugural space flight test at 7:05 a.m. EST Dec. 5 from Cape Canaveral Air Force Station’s Complex 37. 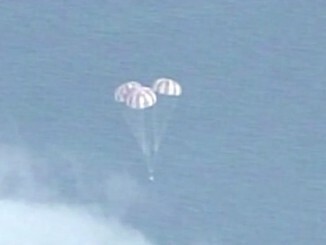 Boosted to an altitude of 3,604 miles by a Delta 4 rocket, NASA’s Orion deep space exploration vehicle fell back to Earth Friday in the program’s maiden voyage, slamming into the atmosphere at nearly 20,000 mph, enduring a hellish 4,000-degree re-entry and settling to a Pacific Ocean splashdown to wrap up a critical unmanned test flight. 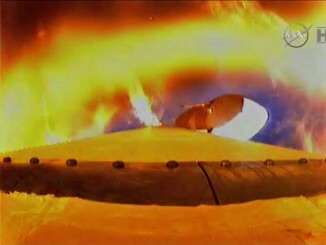 Video as seen live of the Orion spaceship launching atop a powerful Delta 4-Heavy rocket from Cape Canaveral on Friday, Dec. 5. 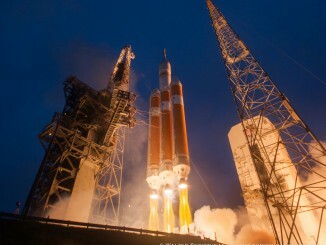 The United Launch Alliance Delta 4-Heavy rocket lifts off with NASA’s Orion spacecraft on its inaugural space flight test at 7:05 a.m. EST Dec. 5 from Cape Canaveral Air Force Station’s Complex 37.